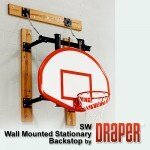 Wall mounted basketball backboards & expert advice to help you choose the best equipment for your gymnasium and budget. From parts to complete systems it’s all here! The Draper Wall mounted basketball goals and custom cut to order. They can typically take 2-3 weeks to arrive once your order is placed however the quality and savings make them worth the wait!